Solar Water Heaters is all the new way and one of the cheapest and renewable resources available for heating water in your homes. Solar Water heaters can reduce the annual energy costs related to heating or preheating your water by half than your existing storage water heaters. Now, what solar water heaters are? A Solar Water Heater is a machine that gives you hot water for various purposes like bathing, washing, cleaning, etc. by means of solar energy. You can easily install it on the roof or terrace where the sunlight comes. And with this solar energy, the solar water heaters heat the water during day time which is then collected in an insulated water tank for further use. Selecting the best models among the variety of choices is quite difficult. 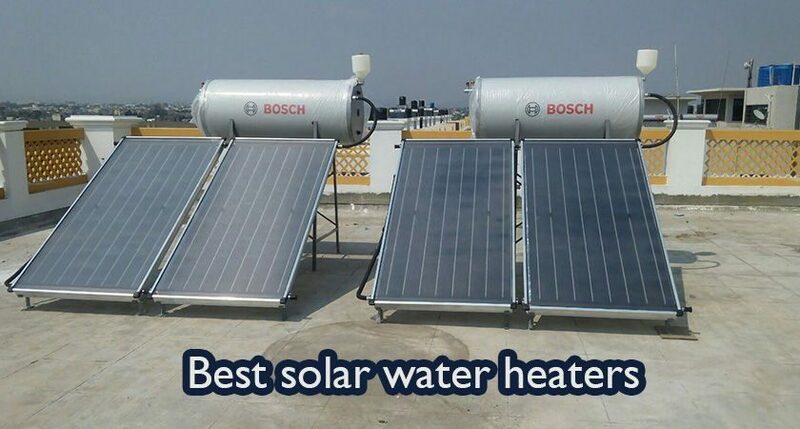 But you don’t need to worry as we have gathered here the best of the best solar water heaters to help you pick only the best. So, just have a quick look on all these most popular and latest solar water heaters before going through the full reviews of them. This model from Racold is one of the best solar water heaters comprises a host of unique features. It consists of the most superior SS445 inner tank with unique welding free technology. SS445 is the best and superior quality material for the water tank that ensures better anti-chloride performance. This water heater comes with a digital display comprising water level display, temperature display, and programmable electric back up. It has also an auto water feed system including auto supply, pre-set time supply, and manual control of water supply. And all these three programmable modes you can use through the digital interface. A programmable backup heating feature is also available with this solar water heater that allows the end-users to set a time to start back-up heating and thereby reaching the present temperature. 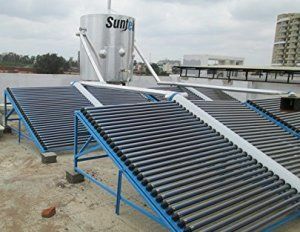 Manual heating is also available with this solar water heater. Solar is one of the well known manufacturing companies that offer water heating systems for homes as well as for commercial uses. This Solar Water Heater from Solar uses high energy absorption vacuum tube of 1800 mm length which ensures optimum energy absorption and high efficiency. Its specially treated inner container ensures the durability and resistance against corrosion. 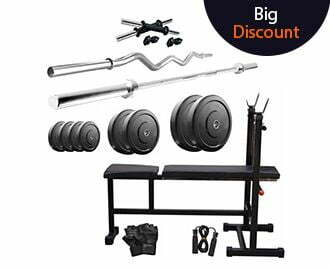 Also, it comes with durable and stronger outer body. The unique design features of this solar water heater from Solar ensure durability, low maintenance, and also blend seamlessly with building aesthetics. This solar water heater will absolutely be your great pick if you are seeking for the best solar water heaters. It comes with a capacity of 250 Litres. Its high-quality coating is best for excellent sunlight absorption and enables quick heating. This solar water heater is made up of high-efficiency solar cells. And it offers higher impact resistance using scratch resistant toughened solar glass. 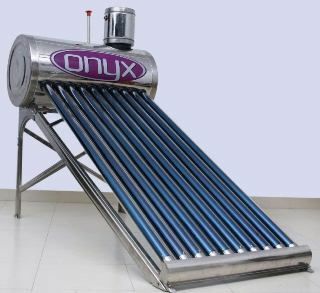 This solar water heater from Onyx is very popular for its high tolerance to hard water. Also, it has the ability to heat water to the higher temperature by the high efficiency evacuated tube collector. This solar water heater is equipped with an in-built device with the anti-fogging capability and also features the ETC (Evacuated Tube Collector) made with aluminum. It is a durable appliance as it comes with a non-corrosive polymer tank with leak proof design. 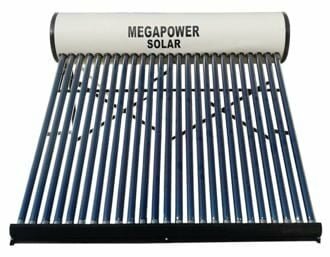 This high-efficiency solar water heater from MegaPower is indeed a must buy because of its amazing features. It comes in an adequate size and dimension that makes it an ideal choice for every household. This solar water heater is perfectly constructed for outdoor and roof set up. The design of the glass tubes are such that helps in collecting maximum heat from sunlight. This solar water heater has been crafted from the high-grade material.As the panels are light and durable, so you can easily set them up. It also comes with easy to use controls that make it the best. This solar water heater from Rocksunsolar is another smart choice for an eco-green water heating needs. With the capacity of 250 liters, it is an ideal option for the household applications. It comes with a stainless steel welded inner tank with superior quality PUF insulation that retains the hot water in the tank for a long time. The material used in this solar water heater is of high-quality standards ensuring the durability and long life of the unit. The Suntek solar water heater comes the next in our list of best solar water heaters. It comes with the capacity of 100 litres for your daily warm water needs by means of solar energy. This solar water heater has a large stainless steel inner tank with superior quality PUF insulation. Save a huge on your electricity bills, energy as well as environment with this superior quality metal solar water heater. Active Systems comes in two types- Direct Circulation Systems and Indirect Circulation Systems. The Direct Circulation Systems are ideal for the places where temperature doesn’t follow below zero. It pumps the household water through collectors which is then delivered in your house for use. These units come with the automatic controllers to sense the sunlight. On the other hand, Indirect Circulation Systems functions well in temperatures below zero. But these units are expensive. These units heat the water by pumping it through a heat transfer fluid and then delivered through the collectors and a heat exchanger. The passive systems are also available in two types- Integral Collector-Storage Passive Systems and Thermosyphon Systems. The Integral Collector Storage Systems come with the storage tank, solar collection unit, and pipes that pump cold water into the collector. And therefore an ideal option for the households with significant water needs. These units are ideal for the areas where temperature doesn’t fall below zero. While Thermosyphon systems are the most reliable one and great for the households with strong hot water needs. These units are also expensive and work well in the area where temperature falls below zero. Geographic Location- Your geographic location is an important aspect before purchasing a solar water heater. Solar water heaters work only when they receive the direct sunlight. So, if you are living in an area closest to the equator, the unit really works very well. But the locations where there is a lack of sunlight, don’t go for the solar water heaters. Size and Capacity- Opting for the big size is an ideal option if you have enough space on your roof for its installation. Storage capacity is also an important consideration. To cater the hot water need for a small family with 3-4 people, a 50- to 60-gallon storage tank is fine. But for the large family, it is great to choose the one having the 80-gallon tank or more. Type and Functionality- There comes the two types of solar collectors- The Flat Plate Collectors and Evacuated Tube Collectors. The FPC is made up of copper or aluminum metals and are quite bulky in size and also the expensive ones. With the features consisting of robustness, durability, and easy maintenance, these are ideal for the tropical climates. And on the other hand, ETC have high heat retention capacity that makes it suitable for both tropical and temperate regions. But since these are made up of glass, proper handling is required during installation, servicing and operation. Type of tank used- Always go for the solar water heaters with the thick tank to store the heated water. It is also important to check that the tank should have enough capacity to retain heat for at least 60-72 hours. Brand- Always go for the branded solar heaters that have certification standards. Since it is an expensive deal to purchase and install a solar water heater, it must be a good quality product so that you can use it for the long run. This is all about the best solar water heaters you can buy online. 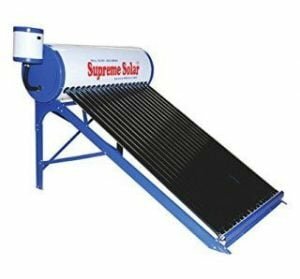 The above mentioned solar water heaters are of course the versatile, and efficient solutions for your homes to get the hot water without using electricity. So pick the one and get fulfilled with ready hot water for all your convenience.